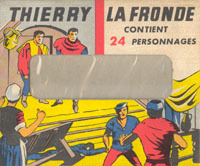 "Thierry la Fronde" was an adventure drama made by ORTF in France about a fictional character named Thierry de Janville, nicknamed 'la Fronde' (the sling). The year was 1360 and the basic plot is Thierry is a Frenchman defending his native land against the occupying English personified by the Black Prince. Sounds familiar? Well basically this was a French version of Robin Hood, complete with Thierry's love interest and the help of monks and a band of outlaw comrades. In all 52 episodes were made and broadcast between 1963 and 1966, and the show was extremely popular, being one of the first ones to spawn a variety of merchandise, all of which is still being collected today. This merchandising included many figures in various scales, and in particular the box of 1/72 scale figures shown above. The purpose of the set is to depict the show of course, and not the historical period, so our heroes wear clothing designed more to make them look good to a modern audience than to reflect contemporary fashions. The detail is not particularly good, so for example it is not possible to see whether the English soldiers are wearing woollen hose or ones of mail, but it would seem that their only armour is the helmet and possibly a mail coif. They carry inappropriate shields and have no scabbard for the sword nor even a knife. Indeed it is particularly noticeable that only the soldiers are carrying any sort of weapon at all, although Thierry and a companion have a bag for their slingshot. The sculpting is not too bad given the vintage but well short of modern standards. Apart from the lack of detail there are obvious problems like the English spearman, who has no apparent hand holding the spear and holds his shield in a very curious way. On our example there was very little flash on any figure. The poses are surprisingly dull for the most part, mainly because no one seems to be doing very much. Of particular interest is the box, which is shown above and can be seen in full here. The style is exactly that of the first type Airfix box, which has lead many to assume Airfix had a hand in its production. However Airfix deny this, and it seems the makers of this set copied the style either out of laziness or to gain extra sales by the implied link with Airfix. With only 24 figures the box is too large, so a card insert was added to ensure the four sprues were pressed up against the window! Although the box makes no claim as to scale, the figures are between 24mm and 25mm tall, so are a close match for 1/72. Our example is still soft and flexible, rather than suffering the brittleness of some figures this age. It is not known how many examples of this set were made, but it has been out of production for a very long time and is today one of the rarest sets in the hobby. This means that despite the figures being of quite marginal usefulness they fetch some of the highest prices for any 1/72 scale set, especially if still in the box.